Enter you username and password and click 'Login' button. Login to the system using your username and password first. Then click on your name in the right part of top menu and go to 'My profile'. Click on icon of the provider you want to connect with. Follow instruction on that site. You can connect your account to multiple providers at the same time. You can use search input to limit the list of items. Fill in the dates and reason. You can write additional notes to 'Notes' section. Then click on button 'Finish booking'. If there's any problem, you will be notified. Once there are no problem, the booking will be placed. BOOKED - this is a new booking. The items are booked, but is has not be verified by anyone. VERIFIED - Verified booking. Person responsible for renting the items verified that the items you want will be ready for you at the dates you want. CANCELED - Either you or administrator canceled the booking. Administrators may cancel it for various reasons, for example when they know that the items will not be available at the requested dates. RENTED - Items from this booking were already rented to you. In the item list, you can choose to display 'Items with special permissions'. This is because there are two categories of things that can be rented. AVAILABLE - These are thing available for booking and renting for every registered user. SPECIAL - You can't book these items (unless you're an administrator). To rent these items you need special permission from the responsible person. To rent items you need higher permissions! This is admin-only feature! Fill-in the form and it's finished. You need to be an administrator to book the items. There is no verification of the dates for the rental, so be careful. 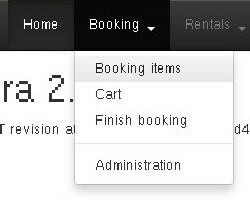 Click on the icon 'Rent the items' next to the booking you want to work with. Items from the booking will be inserted into your 'rental cart'. 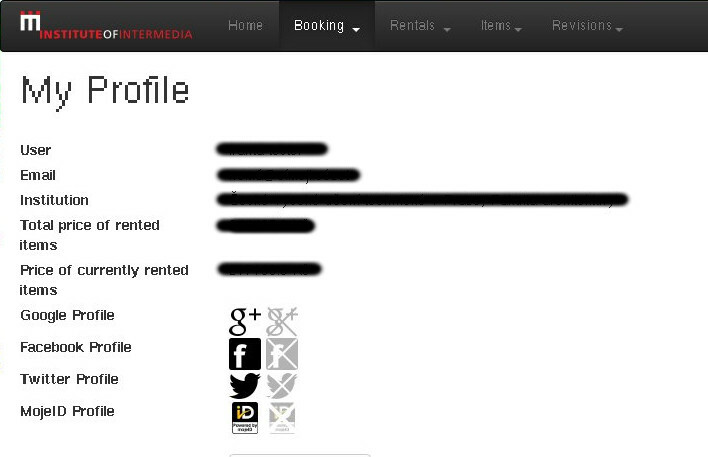 Also, you will have the booking in a 'locked' state - that means you can't do other rentals before finishing this one. Now you can add and/or remove items if you want. Lastly, go to 'Rentals→Finish rental' and finish the rental. The booking will be unlocked and set to RENTED state. To unlock the booking without renting it, go back to 'Booking→Administration' and clock on the 'Unlock' icon there.